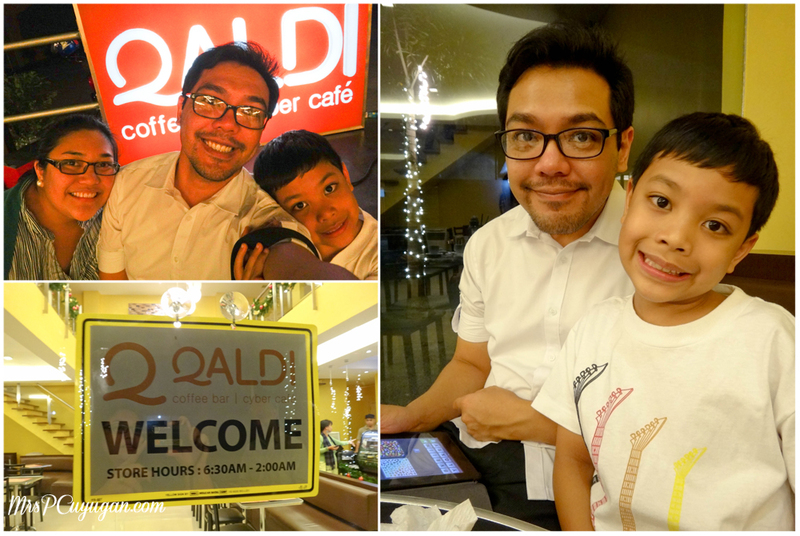 A couple of weeks ago, the boys and I joined a few southie bloggers for a nice Friday night dinner and some coffee at the recently opened Qaldi Coffee Bar and Cyber Cafe in Muntinlupa. My blogging friends would know that I rarely get to go to these events and meetups, but I really made an effort to join this one particularly because the venue was in the south. It’s actually on the other side of Muntinlupa from where we live, but it’s close enough that it’s an easy drive. Plus, I was really curious to see what else was in the Putatan area, because, to be honest, I don’t think I’ve ever been there before. 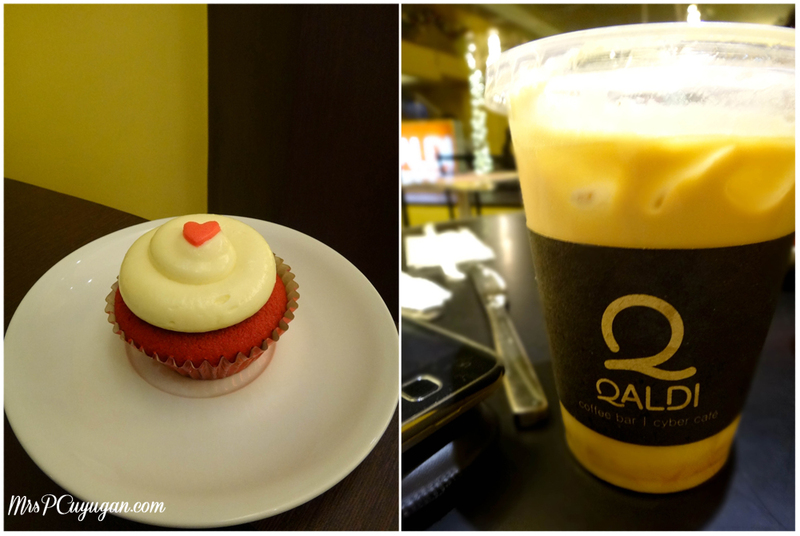 Qaldi is basically a great coffee place with the added bonus of yummy food and pastries. I love that the interiors are bright and roomy. It’s a place where you can sit and eat, work, read, or just hang out. When we were there, the upstairs area, which will eventually be a function room and a cyber cafe, were not yet open. 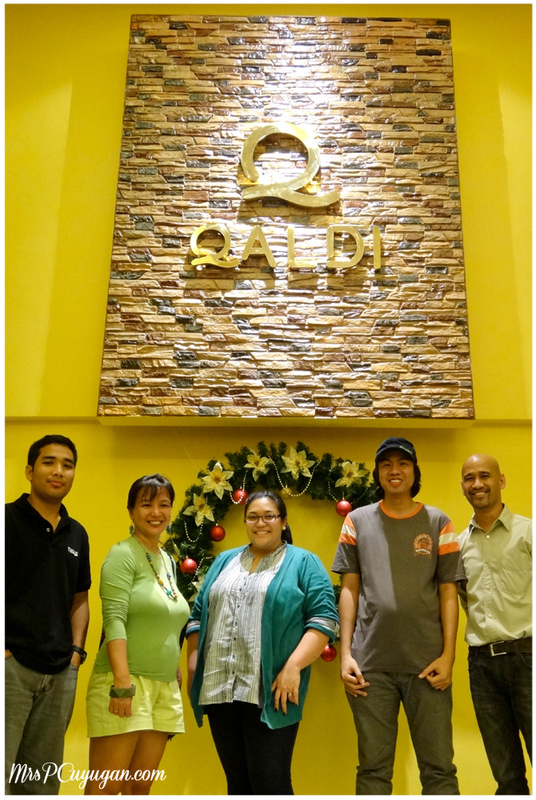 The owner, Joon Tianzon, says that the second floor should be operational by early 2014. I think that the function area would be a great place for meetings or small parties. MrC and I take coffee seriously, and so you can imagine that I had high expectations as far as Qaldi’s coffee offerings are concerned. I’m happy to report that this place serves really good, bold, strong coffee. You know how I know? 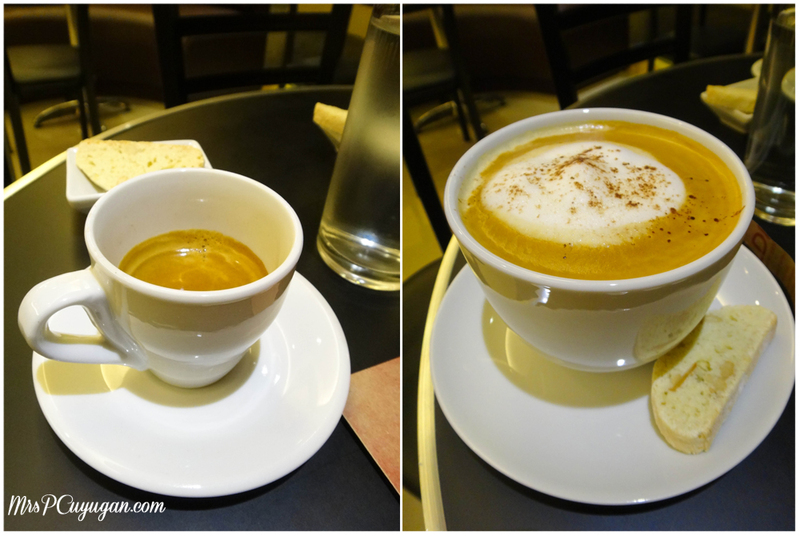 After a large cappuccino and an iced white mocha, at dinner time, I was up until 2am. That doesn’t happen to me with coffee from Starbucks. 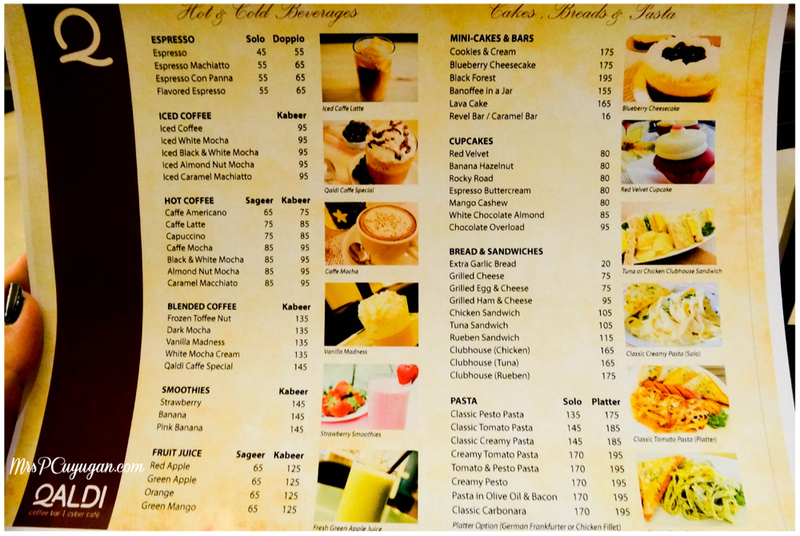 I know that coffee at night sounds like a crazy idea, but our choice of iced coffee and hot coffee were part of the special set menu for the evening, and who am I to say no to a delicious, freshly brewed cup? I remember, too, that on that day we ran out of coffee at home, and so Qaldi basically saved me from a miserable caffeine-deprived headache. 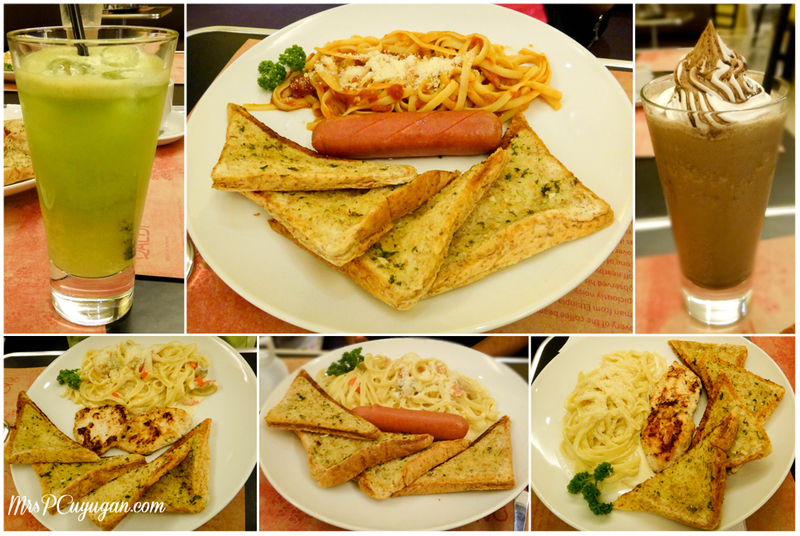 We were asked to order a pasta platter of our choice from among the available selections. 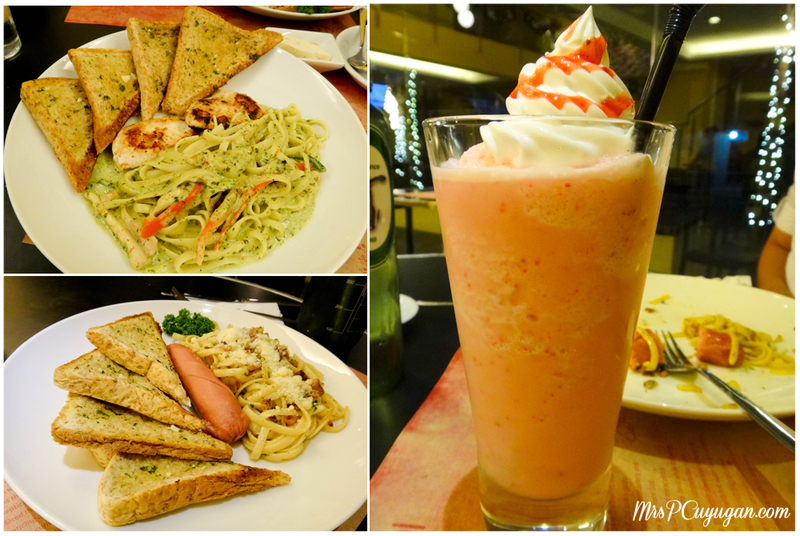 You get a large serving of pasta, plus a sausage or grilled chicken and lots of herb garlic bread with the platter, versus just pasta and bread with a solo order. The little boy chose Pasta in Olive Oil and Bacon with a frankfurter for his dinner, and I picked Creamy Pesto with Grilled Chicken. We decided to get two platters to share instead of one for each of us, which was good because the servings are really big and the food super filling. The boys and I were barely able to finish the two plates. Aside from his food, the little guy also asked for a strawberry milkshake, which was super thick and creamy. I think I made the right choice with the pesto and chicken combo. The grilled meat was perfectly cooked and seasoned, and proved to be a great accompaniment to the creamy, tasty pesto. Our other pasta plate was good too, but I prefer the pesto. I would also choose the chicken over the sausage any day, which says a lot because I am very much a pork sausage person. The other bloggers and I agreed to order an assortment of dishes so that we could give feedback on all the different selections. As far as I remember, everyone was pretty happy with their food. You need to visit their blogs and read their reviews, though, for their full feedback. I know Ron’s post is already up, but I still have to check the others. 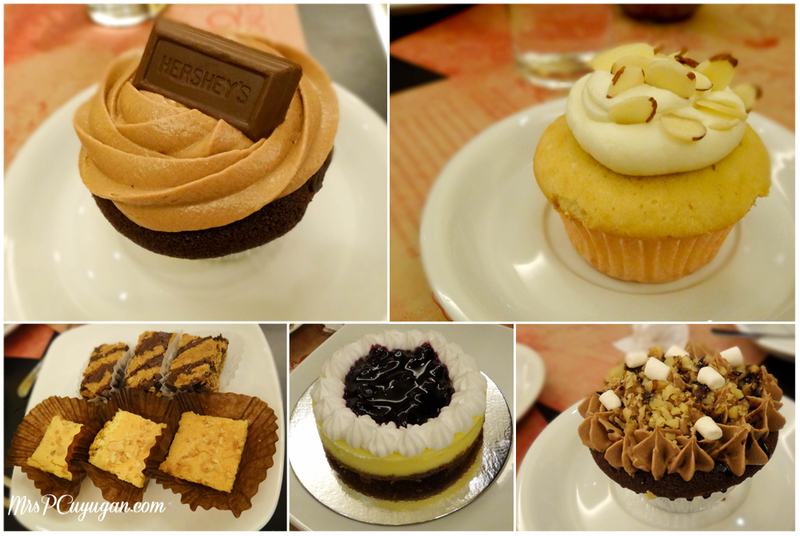 Of course, no meal is complete without dessert. If you know me, you’ll know that I immediately went for the Red Velvet when we were asked to order whatever cupcake we wanted. I think it’s safe to say that my little boy liked it way more than I did. I had about two bites, passed the fork over to him, and when I looked again, it was all gone! We were also given a mini blueberry cheesecake to share and a plate of blondies and revel bars. I loved the cheesecake. It was creamy, and you could really taste the cream cheese in it. Some cheesecakes feel almost like a cross between jello and pudding, but not this one. It had a great texture, and was just sweet enough for me. Mr Joon mentioned that the pastries they served are all prepared by local suppliers and home bakers, and I think this is great. We should support our local businesses and independent entrepreneurs! It’s great to know that there’s a place like this along the national road of Muntinlupa. While I don’t really frequent the area, I’m pretty sure that I’ll make an effort to drop by if I do find myself there sometime soon. 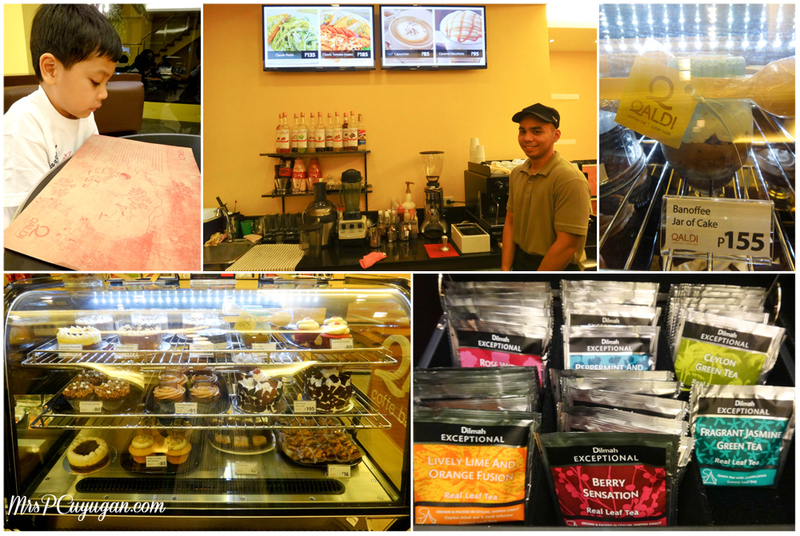 I definitely want to try the specialty teas, their other espresso-based drinks and the rest of the food on their menu. This cup of coffee is a winner! Oh, and I just have to share that on the way home my son told me that he thought the owner, Mr Joon, was “a really nice guy.” I totally agree with him. I felt genuine and sincere hospitality from him and the rest of the Qaldi staff that evening. Check out Qaldi Coffee Bar & Cyber Cafe on Facebook and Instagram to find out more about there latest offers and promotions. Qaldi is located along Muntinlupa National Road, near the City Hall of Muntinlupa and Puregold Agro, right in front of Max’s Restaurant and beside BPI Family Bank. 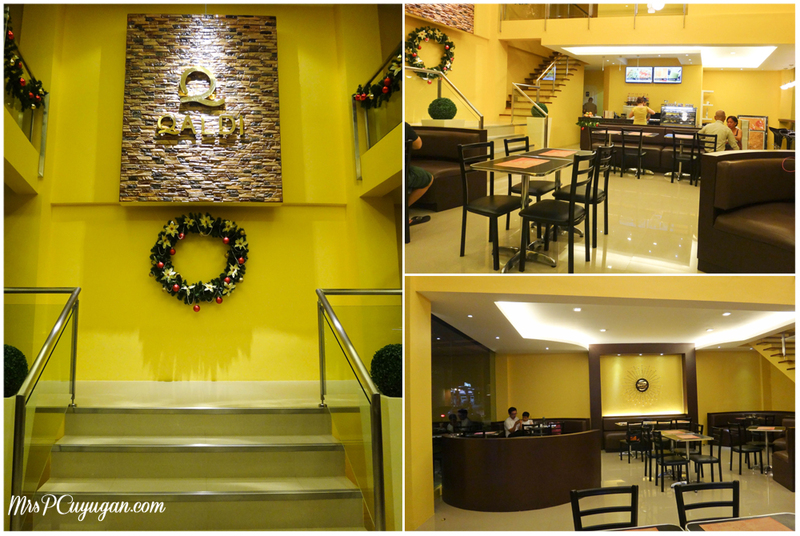 For inquiries and reservations, call 0915 472 2126 or email qaldicybercafe@gmail.com. 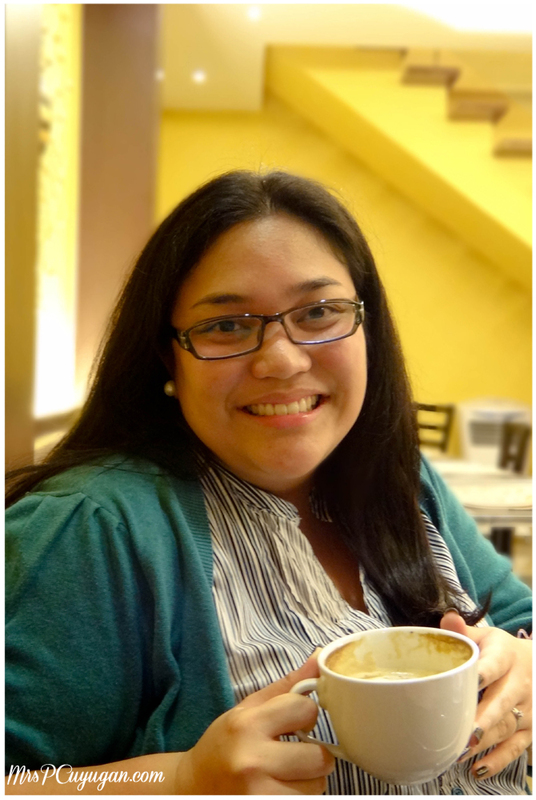 Full Disclosure: I was invited to be part of the south bloggers night, and sample the dishes and drinks on the menu courtesy of Qaldi Coffee Bar & Cyber Cafe. I did, however, pay for the food that MrC and Little MrC ordered. This post was written by me in its entirety and expresses my personal views and opinions, which were in no way influenced by the establishment, its management, staff or partners. Thank you very much Ms. Patricia for a wonderful review. Nakakataba po ng puso. Rest assured we will do our best to serve everyone better! God bless you! Kindly extend my regards to your wonderful husband and to your very cute and sweet Little Mr. C. Have a great and blessed day!